However, sometimes people have health reasons that prevent them from being vaccinated for flu-like a severe egg allergy. Also, some people get the shot and still get the flu, although it will probably be a milder case. In fact, there is a need for a real universal flu vaccine that might only need to be taken once or twice or every few years that could give lifelong protection against the flu. If you are sick you should also stay home to rest and keep your germs to yourself and not infect others. However, you should go out for medical care if necessary and the CDC recommends wearing a mask to avoid spreading germs to others and while sitting in a doctor’s waiting room. The mask will also protect you from picking up more dangerous germs. In fact, the CDC recommends staying home for at least 24 hours after the fever is gone and this does not include taking medications to lower the fever. The idea is that if the fever is really gone and not as a result of taking something like paracetamol, that you may no longer be contagious. Cover your nose or mouth with a tissue when you sneeze and cough and discard it in a closed garbage can. Wash your hands a lot with soap and water, especially if you sneezed on your hand. If you do not have access to soap and water use an alcohol wipe or alcohol-based hand sanitizer. Try not to touch or rub your eyes, nose or mouth as this can spread germs. Clean keyboards, mice, phones and desktops with disinfectant sprays or wipes. Use a cleaner designed especially as safe for cleaning your monitor, especially if you have a touch screen. It is not necessary to have all of these symptoms to get a diagnosis of flu and many of these are similar to the common cold. Only a special blood test can show if you have the cold virus or if you have one of the flu virus strains. Most people get mild cases of the flu and it passes without any kind of special treatment. However, if you are feeling ill or if you suffer from chronic illnesses you should see your doctor. The flu is more likely to come on suddenly and a cold may come on more gradually. While most people who get the flu have a fever, there are people who can be quite ill with the flu who do not get a fever. Antiviral drugs are not sold over-the-counter, but are prescription meds like pills, liquid, IV solution or an inhaled powder. 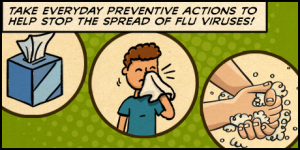 Antiviral drugs work best at the earliest stages of the flu, especially the first two days. However, many cases of the flu begin like the common cold, so people may not think they are ill enough to go to the doctor. By the time it is obvious that this is the flu and not just a simple cold, antivirus meds may not be as effective. However, if your doctor prescribes them then by all means take them. They can shorten the time you are ill and give you a milder case of the flu. They may also prevent serious complications from the flu and thus prevent stays in the hospital. Read more about antiviral drugs with this fact sheet from the CDC. Drink lots of fresh squeezed orange juice to get enough Vitamin C.
Drink a lot of herbal teas like chamomile, sage and anise seed. Use a hot air vaporizer and put 1-2 drops of eucalyptus oil in the place for it near where the steam comes out. You should not put the oil directly into the vaporizer. You can also try adding 1-2 drops of eucalyptus oil to a bowl of boiling water, put a towel over your head and face and inhale the steam. Buy over-the-counter herbal cough syrups. While most people get a mild case of the flu, some people become very ill and in some cases flu can lead to death. If you or your loved one are at Park Crescent Healthcare and Rehabilitation Center in East Orange, New Jersey, you can rest assured that the residents and the staff have all been vaccinated against the flu. It certainly pays to take steps to avoid getting the flu like getting a flu shot and keeping away from sick people.